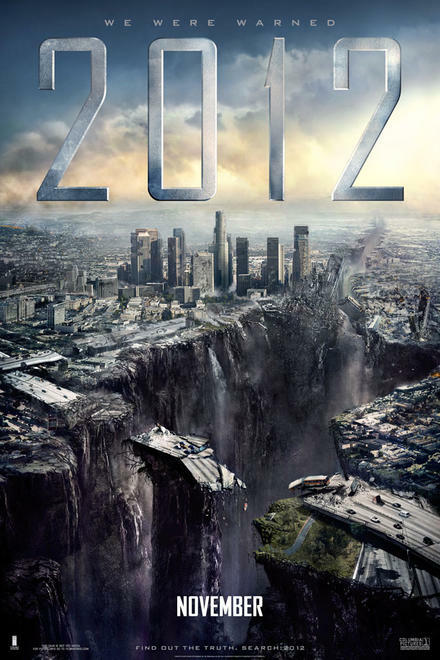 Possibly one of the worst disaster movies of modern memory has to be 2012 starring John Cusack. Jackson Curtis (Cusack) a LA Limo driver must save his family from the unfolding worldwide cataclysmal meltdown as solar flares cause the earth’s core to start overheating. From the beginning of the film to the end they make one improbable… NO impossible… NO ridiculous narrow escape after another as everybody else perishes. Though the CGI special effects are impressive the story line is just too stupid to enjoy. At least for me anyway. 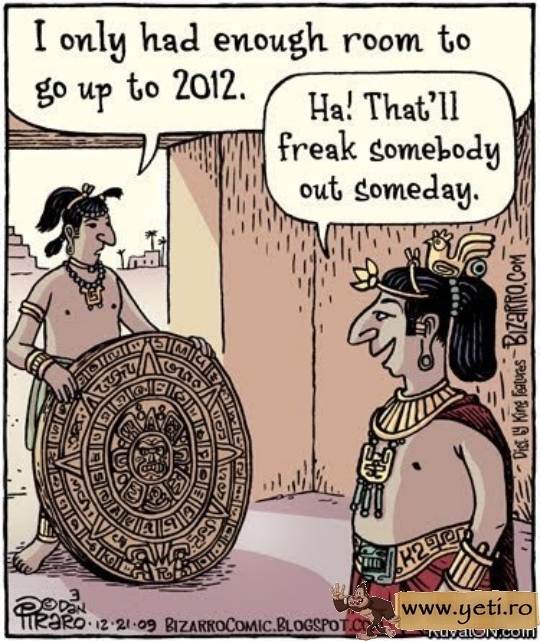 The whole 2012 ‘end of the world’ thing is based on the 5,125th and last year on the Mayan (Mesoamerican) long count calendar. Never mind that there is nothing in the Mayan record that indicates the world is going to end, it just happens to be the last year on their admittedly impressive calendar. The calender sitting on my desk right now ends on December 31, 2012, but somehow I have a feeling that that in itself does not predict the end of time. Remember Y2K? There was this mass hysteria over the date 2000AD. All because Bill Gates (in his software) neglected to recognize any dates after December 31,1999 the world was going to fall into chaos. Computers were going to crash, planes fall out of the sky and the power grid was going to grind to a halt. Those of us in Northern climes were going to freeze and starve to death. I had pastor friends of mine that stocked up on fire wood and bought gas powered generators. When they asked me if i was going to buy a generator I said, “Sure, on January 1st when they are on Kijiji for 10 cents on the dollar.” In fact, in a rather cocky display, I told my congregation that I emptied my fridge and hauled what little firewood I had to the dump. I really did do that and the whole point was to send a message to our church to not to buy into the irrational hype. Turned out I was right. An easy call by any estimation. One of the things you can almost always go to the bank on is this: anytime the majority of people agree on anything, they are almost always wrong. 2011 was actually a very impressive if not a watershed year. The cascade of major worldwide events was dizzying. The dictatorial rule in many Arab rules came crashing down; Tunisian President Zine El Abidine Ben Ali was ousted, Egyptian President Hosni Mubarak was toppled, Libyan madman Colonel Moammar Gadhafi was gunned down. Greece, the birthplace of democracy went bankrupt. A tsunami cripples Japan and trips a nuclear reactor meltdown. The horn of Africa slides into another famine and millions starve to death. Drug violence in Mexican border cities escalated to the point where it was no longer safe to drive into Mexico from the US. (Our missions work in the city of Matamorous had to be put on hold and we have now shifted our efforts to Haiti.) The list goes on and on. If you were not paying close attention you might have missed that fact that our world has probably changed for ever. 2012 has begun pretty unspectacularly so far. All that could change in a hurry. I think the wildcard for this year is Iran. None of the other Muslim countries have the potential to turn the world upside down like this one. 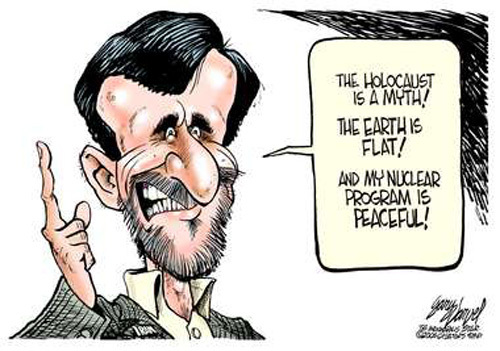 That is because it is now a nuclear power under the leadership of nut job President Mahmoud Ahmadinejad. Men like this are hard to understand until you begin to study the mindset of the radical Islamist. I just finished reading The Blood of Lambs by Kamal Saleem, a Lebanese terrorist that converted to Christ and is now assisting the CIA in counter-terrorism. It was a great help to read about the context that these Arab leaders have been born and raised. They have been steeped in a worldview from the womb that sees Israel and the West as the great Satan and an enemy that needs to be eliminated at any and all costs. Though I still think Ahmadinejad is crazy I realize he comes by it honestly. That of course doesn’t make him any less dangerous. Presently Iran is amassing troops along the Afghanistan border and conducting showy naval exercises in the Persian Gulf. There has been talk that they are considering blocking the trading route in the Strait of Hormuz. The west will never allow this. Add to that the fact that last week Amir Mirzaei Hekmati, an Iranian-American born in Arizona who was visiting family Iran was convicted of being a CIA spy and sentenced to death. My concern is that if they execute him the US will use it as an excuse to invade Iran. The US military has been quietly sending ships and planes into the Persian Gulf. It even looks like Canada is might be getting into the act and has just sent the HMCS Charlottetown to the Mediterranean Sea as part of a NATO counter-terrorism mission. Even though Obama has just finally pulled out of a questionable war in Iraq which cost $800B and countless lives, the US war machine has an insatiable appetite for conflict. With billions of military dollars at stake and many of the American politicians in their back pocket, the massive arms industry has a vested interest in always keeping America at war. Not a great prospect at all for what is playing out in the Middle East presently. Having said that Jesus said, You will hear of wars and rumors of war, see that you are not troubled… It is hard not to be a little troubled, but we remember that God is sovereign and ultimately in charge. Historically He has always been known to use world events as part of His great master plan to advance His kingdom in the world. At the moment we are doing quite a pathetic job of reaching the Arab world for Jesus. So I have to believe that all this has something to do with the coming of the greatest wave of evangelism the world has ever known. 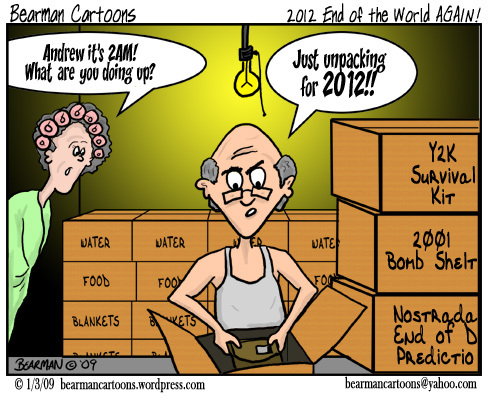 In the meantime I know the world won’t end in 2012. How? Because Jesus also said, This gospel of the kingdom will be preached to all nations and then the end shall come. The world can’t end… we have too much work to do.